This review was prompted by a small number of Opponauts who responded to an image of this machine in my recent Made in Italy post. The typical response was yes it’s a lawn mower but what what the heck is it? Yes…it is a machine for cutting grass but it is most definitely not a lawn mower. Go-kart with a bullbar and recovery point! Grillo SpA is an Italian company (established in 1953) that began making what are known as walking tractors. These are small self propelled two wheeled machines that can be used to do a number of tasks like ploughing and tilling in small agricultural holdings. They still make them today but have since expanded to produce a number of small to medium sized agricultural machines including roto-tillers, ride-on lawn mowers and tracked dumpers. 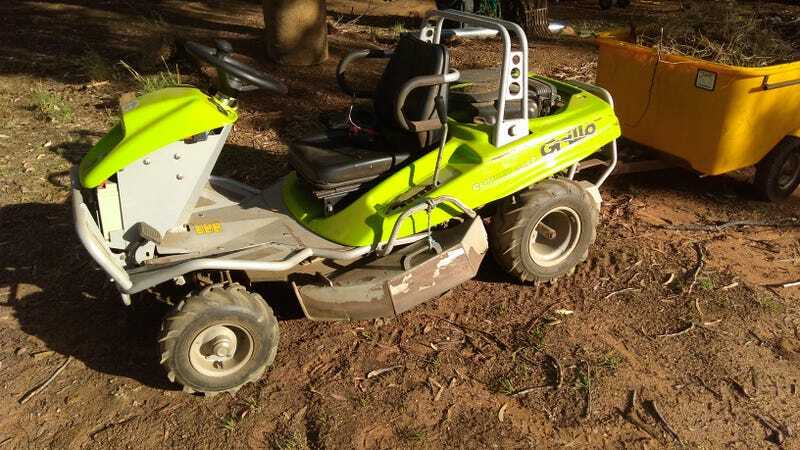 The Grillo Climber 7.16 is part of Grillo’s Special Garden Machine range…even they don’t consider it a lawn mower. It is designed to cut grass on steep slopes and rough ground. Think of it as a ride on slasher. Its most obvious primary point of difference from your average ride on lawn mower is the go kart like seating position which provides both a very low centre of gravity (therefore impressive stability) and an ergonomic challenge that would make Ferrari proud. The 7.16 is roughly 1.9 metres long, 0.95 metres wide and only 0.97 metres tall. That’s 6’4”, 3’2” and 3’3” for the metrically challenged. It weighs nearly 250 kgs (550 lbs) when filled with all the fluids. It is powered by a Briggs and Stratton 16 hp Vanguard V-twin engine that sits directly behind the driver (rear engine!!) driving the rear wheels through a hydrostatic gearbox situated directly under the engine. The machine is geared to max out at around 9 km/h (5.5 mph) in the forward direction and around 4 km/h in reverse. Rear mounted engine...like a Ferrari! There is a very clever diff lock set-up for the rear wheels. Hydrostatic drives on their own tend to deliver power based on the path of least resistance so if one wheel lifts off the ground then all power is delivered to that wheel and forward motion ends. Grillo gets around this by fitting both driveshafts with a sprocket inboard of each wheel. These are each connected by chain to sprockets on a second axle behind the wheels. The axle is split by a cable operated clutch. When a pedal in the cockpit is compressed, the clutch plates are joined and the axle becomes whole. This in turn links the main driveshafts and drive is equalised through both wheels. It works a treat. Operating this thing will be immediately familiar to anyone who has ever driven an Italian made sports car from the previous century. Getting in and out is an exercise in contortion (one that will be impossible for anyone over 6 foot tall or those of a stouter nature) and yet the seating position is glorious – snug, encompassing, retaining and with just the right relationship to the primary controls. The primary controls feel great in the hands but when you come to actually use them then the Italian approach to ergonomics rears its head because nothing is quite what it seems. There are two foot pedals. The one under the left operates the aforementioned diff lock while the one under the right foot operates the drum brakes inside the front wheels. Unlike virtually any other lawn mower or tractor with a hydrostatic gearbox...there is no GO pedal. Engaging and maintaining progress in either forward or reverse is done with a lever that falls beautifully to your right hand (just like the gearstick in your favourite 20th century Italian sports car). Diff lock pedal and a fidget spinner. Note the many pretty screws. Note the missing screw on the front cowl...which also hides the battery. All this means that you have just one hand left to do the steering. Suitably, it is the left hand. Grillo have attempted to make this actually possible by fitting a hand spinner to the steering wheel. However, the small size of the steering wheel (necessitated by the constrained seating access), the chunky steering tyres and the weight balance of the machine means that there’s lots of steering effort required, especially at slow speeds. So operating it is a work out. Deck height control. The gum leaves are used to ward off Drop Bears. Build quality is suitably Italian. It’s beautifully made but in that overly fussy and slightly complicated way that we have come to know and tolerate from our Italian friends. The Climber’s tubular steel frame is bent and welded into a work of engineering. There’s nothing so simple as two pressed metal beams bolted together to form a chassis as you would find in a conventional ride on from Toro or John Deere. Laid over this space frame chassis are bespoke laser cut and folded (not stamped) steel sheets that are fitted using Torx headed machine screws and captive nuts. The engine cover and front cowl are polycarbonate plastic, again held down with Torx screws and captive nuts. All this makes it very nicely finished but of course the Climber is a high vibration environment so the fact that we’ve lost a couple of screws after 100 hours of operation is not a surprise. As with any Italian sports car…the Climber comes with a premium price tag. This example set my parents back nearly $10,000 Australian dollars nearly five years ago. The current model is the 7.18 and is largely identical apart from the B&S Intek engine retails in Oz for $11,500. This is in the sort of territory occupied by large zero turn mowers and even some small garden tractors. So it doesn’t come cheap. However, if your property is one of those places that has a couple of acres that is hard to get to or on a difficult slope for your average ride on then the Climber is well worth your consideration. Now…if you are one of those Oppo’s that fancies his or herself a racing mower…then this is the chassis for you. Without the underslung deck and some tweaking of the gearing, the Climber will behave like a go-kart on stilts. There’s even an optional suspension seat to keep the bumps at bay. So if you see one lying forlorn and forgotten…then think it as the ride on mower version of the Lancia Stratos with an LS swap.